Bunaco company was founded in 1956 in Aomori prefecture on the northern tip of the main island of Japan (Honshu). This is an area with an abundance of beech trees. Bunaco aims to produce eco friendly and flexible products. Their method of production involves slicing beechwood in 1mm thick slices to make a 1cm-wide ribbon-like strip. This is wound around a solid round base to form a coil of timber. This provides a base for making a great variety of shapes. Bunaco products have won many design awards, and have been exhibited around the world in prestigious exhibitions. Born in Madrid, Spain, in 1974. At age of 23, he was promoted to head of Design Department of Fabrica, the Benetton-funded design and communication academy. 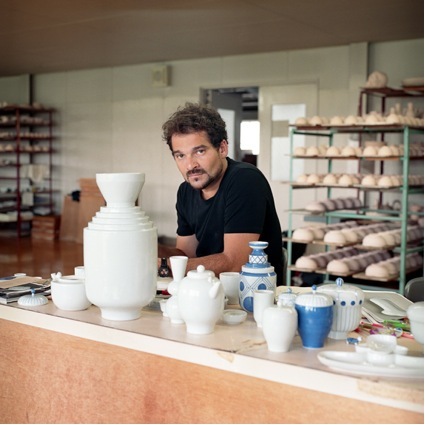 His works for global brands includes Lladró, Baccarat, SWAROVSKI, CAMPER, Establish & Sons, and moooi. Jaime is one of the most symbolic creators of this decade. Established in 1879 at Terai Mura, Nomi-gun, Ishikawa Prefecture as a pottery maker of Kutaniyaki. For over 130 years they have handmade table wares and tea sets using the original traditional technique which is passed on from generation to generation. Their pieces feature very fine art work with deep colors and durable, beautiful porcelain. Kutani pottery is one of the representative traditional crafts of Ishikawa. It is a porcelain product that features glazes using 5 traditional Kutani colors (red, blue, yellow, purple and green). The history of Kutani pottery dates back to around 1655 in the early Edo period. It was first made by the order of Toshiharu Maeda, the first feudal lord of the Daishoji Clan, the branch of the ruling Kaga Clan in the area. Its bold design, brushwork and fine painting still attract many people today. However, the Kutani kiln was closed down abruptly in around 1710. The reason is unknown even today. 100 years later the kiln was opened again and run by the Kaga Clan, inviting many craftsmen and designers from Kyoto and Edo (former Tokyo) and producing various styles of Kutani pottery. Free-spirited nature of Kutani has been handed down over generations up until to the present time. A creative product producer team and a Japanese style product brand, headed by Hirotoshi Maruwaka, established in 2007. “Where should Japanese crafts go?” is their fundamental question. Maruwakaya works and collaborates with many craftsmen and companies all over Japan to lead the direction of Japanese crafts. One of their popular products is “otsuriki” iPhone cover, which uses traditional craft “inden”, presented at DESIGNTIDE 2009. “We were able to sympathize very much with the fascinating ideas from Jaime Hayon and his attitude toward creations. The story begins when Maruwakaya, a neo-traditional Japanese product design brand, and the world renowned Spanish designer, Jaime Hayon, met at DESIGNTIDE TOKYO 2009, one of the biggest autumn design festivals in Asia. Hirotoshi Maruwaka, the producer of Maruwakaya, asked Hayon a question with a strong intention in mind. 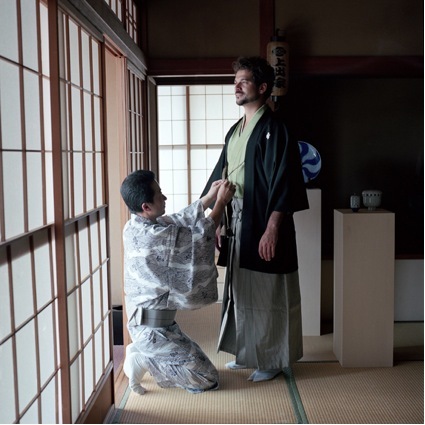 Was he interested in working with Kamide Choemon-gama, a pottery company making one of Japan’s most acclaimed traditional porcelain crafts, Kutaniyaki. Maruwaka told Hayon that he wanted to produce new ceramic crafts combining Hayon’s creativeness in design with Choemon-gama’s craftsman skills. Hayon, having been inspired with the works of Choemon-gama at a previous Designtide, agreed at once. This was the start of this fateful cross-cultural relationship between one of the most outstanding designers of today, taking his first challenge to work with Japanese crafts, and Japanese traditional craftsmen who had no experience of working with other designers ever before. Though their backgrounds differ in many ways, they felt confident that they could create something they would be proud of. One keyword that tied them together was “Tsunagari (meaning relationships)”, which also was the title of the exhibition by Keigo Kamide, the sixth Kamide Choemon-gama, in January 2010. It is believed that the key ideas in traditional Japanese culture, especially ones at the dinner table, are based upon relations and links between the people at the table, food, seasons, and table wares. Thus the goal was to create pieces that help people recognize these relationships. In order for Hayon to understand this keyword from heart, they decided to go on a journey finding “Tsunagari” in Japanese culture. This search took place in Asakusa town environment, traditional performing arts such as Kabuki, a fish market in Kanazawa, Kaiseki ceremonial meal, long established soba restaurants and many more. One night at a traditional dinner in a ryokan, a Japanese style inn, Hayon was really fascinated with the wide variety of Japanese tableware, each serving for different purpose. This night, he felt and experienced the real “Tsunagari” in Japanese culture. What is most important is not the knowledge, but is what you feel in the heart. At the pottery company, Hayon surprised the craftsmen by introducing very unique and original ideas but by also keeping the traditional feel of Kutaniyaki. Kamide Choemon-gama fully trustrd Hayon to take this new challenge. There was an exchange in souls in between the two to achieve their goal. Their creative souls had bonded together as they spent time communicating, checking, making things work, and sharing joys together. Though Hayon came from a different part of the world, what they have created stands proudly as genuinely Japanese with Japanese spirit. Spending hours and days at the pottery company, Hayon and Maruwakaya became a part of the family of the craftsmen of Kamide Choemon-gama. This is the story of Tsunagari, and the pieces we’ve created are the message of the story. We hope you could hold the pieces in your hands and feel the message from our heart. “For us, it is never about just simply bringing in what is “in” into traditional crafts. Of late, we hear people saying “Japanese traditional culture is great” but the fact is, we find a lot more of imported DC brands or “Japanese-ish” products without actual identities or meaning. This is the kind of Japan, we live in right now. Our aim is to make more appealing products with the traditional and authentic Japanese aesthetic sense. With this project, we felt as if Jaime was telling us Japanese to have more pride in our crafts and cultures. The designer of "Fadeclock" recognises the role of paper in our society is changing. Whereas paper used to be a vital tool for communicating knowledge and ideas, it is no longer the only media used. In an effort to return to the past, and give paper a meaningful use, the designer's idea is to use it a different way for familiar items. Momo et associes means "Momo and his friends" in French. "Momo" means "peach" in Japanese. He is a dog with many friends and a tail which always wags. This studio concentrates on dyeing and felting. They make a variety of beautiful products using these crafts. The felt is all hand made using water, some tools, and the human hand! The wool is shrunk using water. Dyeing can be done using plant dyes or chemical dyes. Care must be taken not to ruin the texture of the wool. Products such as bags and rugs, which need high strength, need many layers of wool, and this must be aligned very carefully. This requires much patience. Rolling is an effective way to achieve this, and this process can take up to two days, and much strength! Continual use of the products, such as holding the bag handle, will change it's shape in time, and it will become individualised. Sewing of the bags is done subtley, so it does not become a feature of the items. Then the bags look like one whole object made from one piece. "mono" means product in Japanese. "Onomatopoeic"' means a name that makes the sound the object makes. This is "monomatopee", adding a little spice to your life! "monomatopee" was launched this year. Marumasu Co. Ltd. has been in business for 110 years, since the 34th year of the Meiji Period (1910). Periods in Japan's history are named after the emperor of the time. "monomapotee" was started by Kazuhiro Matsukawa. He is the fourth generation of the Marumaru Company. Marumasu Co. Ltd. is a small factory in Tokyo, which until now, has been producing textiles for the fashion world using original technology. Due to the nature of fashion, many of these fabrics become redundant, and it seemed sensible to start their own brand using interesting textiles which would be sustainable and timeless. The material used is cotton, and has been traditionally used from the Heian Period for fishing nets and mosquito nets. A special resin was developed over four years, which emphasises the fluorescence in the colour, and gives the fabric greater durability. The designer of the measure calendar, Hiroyuki Miyake talks about how this wonderful idea came to be. "At the end of 2010 I was asked by the owner of a bar, to design a calendar for 2011 as a gift for customers. I looked around me and recognized that the desk calendar or the card type calendar had almost disappeared. "DIGITISED TIME" in the form of personal computers or mobile phones appears at the click of a finger, and makes our lives very convenient. However, isn't "time" a fragmentary existence without need of numbers? In the process of reconsidering a calendar which gives me the feeling of the passage of time, I designed the measure type calendar which transposed 1 day to 1 cm, denoting time by distance or length. Then we (I and the owner of the bar) converted 150 ready-made measures by manual labor and distributed them as gifts and received various opinions. It led to the manufacture of this 2012 version. In order to also function as a tape measure, the number described every 5 cm expressing length means "it is how many days of this year (Jan-Jun)" and "what after remaining days (Jly-Dec)". I felt the transiency of the change at the time, and the value of business of people by the length of the visualized time. I had the firm belief that this was not only the design of a form or a function, but a design which demands thinking from people. In an age where everything is digitized and even time loses some of its feeling, I hope that people are reconnected to a past era, or the future which flows and comes for people who take this [measure (time) calendar].